While dental veneers are gaining popularity as the fastest way to create a perfect smile, our handcrafted dental veneers do so much more. When our ultra-thin veneers are bonded to the front teeth, they mask discolorations, correct and restore chipping, cracking and breaking, and straighten and balance your bite for more comfort and beauty than you could imagine. Our porcelain veneers are highly resistant to permanent staining from coffee, tea or cigarette smoking. We can achieve a tenacious bond to the tooth resulting in an aesthetically pleasing naturalness that is unsurpassed by other restorative options. We don't have to rely on big name brands for our veneers. The best veneers are handcrafted by the best ceramist in the world. We are privileged to work with these wonderful artisans. Their precision crafting art is their brand. 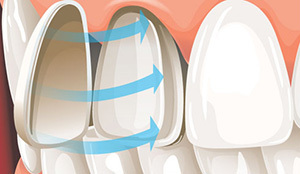 Each tooth perfectly mimics the subtle layers and translucency of your natural teeth. When these custom works of art are bonded to tooth structure they have the strength of natural enamel. We will work with you as an artistic team to custom design your smile. Together, we will decide the shape, color and size of your teeth to create a smile that looks so natural no one would doubt that the dental veneers were your natural teeth.